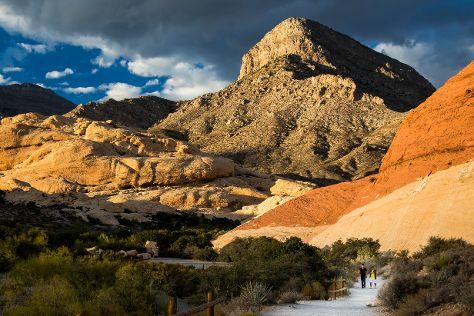 Venture out of the city with trips to Bristlecone Trail (in Mount Charleston), Henderson (M Resort Casino, Clark County Heritage Museum, & more) and Overton (Mouse's Tank, Valley of Fire State Park, & more). Spend the 10th (Fri) riding across the waves with a waterskiing or jet-skiing adventure. Spend the 29th (Wed) exploring the stark beauty of Escape Adventures and Las Vegas Cyclery. There's still lots to do: take in breathtaking views at Red Rock Canyon National Conservation Area, admire the local landmark of Bellagio Fountains, admire the engineering at Hoover Dam, and take in the views from Hoover Dam Bypass. For ratings, other places to visit, photos, and tourist information, go to the Las Vegas trip planning app . In May, daily temperatures in Las Vegas can reach 87°F, while at night they dip to 64°F. Cap off your sightseeing on the 7th (Fri) early enough to travel back home.